Well after watching Leann Chivers doing the 4DD on create and craft this week and enjoying the demonstrations that she was doing, I thought I would have a play. Luckily for me I already had some of the items shown on create and craft. Christmas magic Christmas time sentimentals rubber stamp. Tim Holtz stormy sky distress ink pad. The ribbon and the blue pearls are from my own stash. The others I have got from www.crafterscompanion.co.uk website. Beautiful cards Sam! 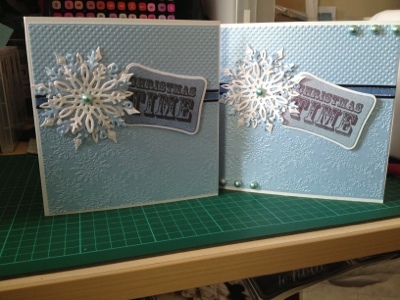 I love the beautiful embossed background and the fabulous snowflakes. Wonderful Christmas cards, fabulous snowflakes and embossing.